The line of Multnomah Village people anxious to sample a different kind of donut Saturday morning stretched from the just-opened Blue Star Donuts south on SW Capitol Highway to Starbucks. Awaiting them at the end of the line was a free donut. His daughter Audrey Clark chose a lemon poppy seed buttermilk donut. "It's a little 'bready' for me but tasted really good," she said. Will the Clarks be back? "Our rule is that if we walk this far we can have a donut," said David. Blue Str staffer Daniel Midget was working the line, reassuring people there would be plenty of donuts and handing out Blue Star Donut stickers. "We're pretty well-equipped for a line this size," he said. "Actually, we're equipped for two or three lines this size. We'll be giving away donuts until this afternoon." 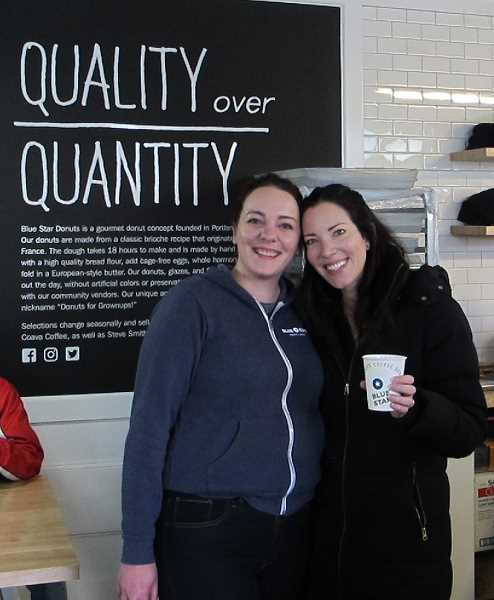 Inside the just-opened store next to Little Big Burger on the ground floor of the Multnomah Village Apartments, Blue Star owner Katie Poppe (pronounced Pope) was beaming. "This is such a great neighborhood community. There's such a great mix of businesses and feelings, and churches and schools," Poppe said. "We're all about supporting and integrating ourselves into the community. It's a perfect fit," she said. Outside, George Carruth said he was surprised at all the people. 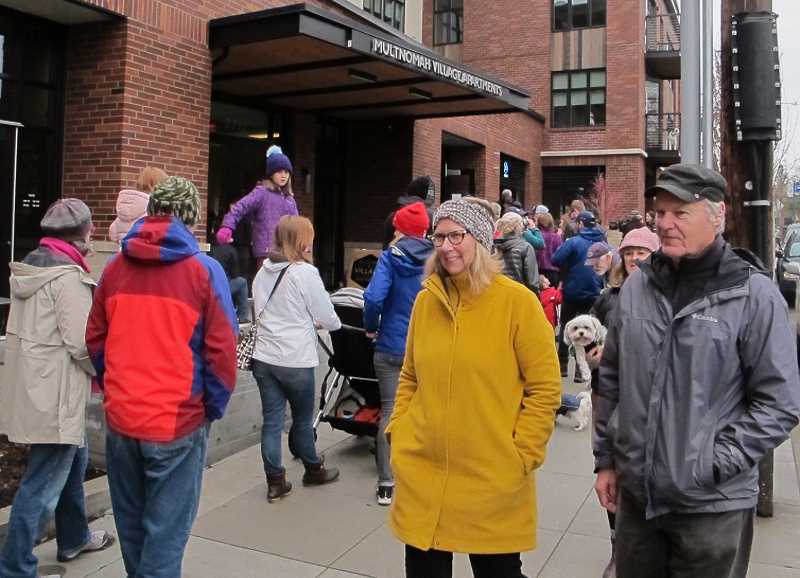 "It's such a positive turn out from the community," he said of the line snaking down SW Capitol Highway on this unseasonably mild January morning. "I'm really impressed. It's mostly families with children. 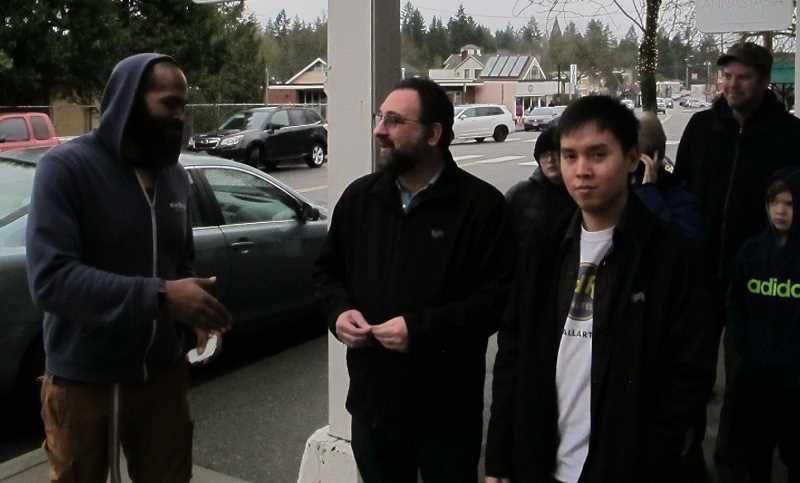 It's just fun to see the support the community's giving them. " He would pass on the sample donut. "We came too late. I mean they still have donuts but I'm not going to wait in a line that long for a donut," he said. By 10am the line was a bit shorter. It only stretched as far as the Anatasia Salon.